Dubai: HMD Global, the company that makes Nokia phones, launched the Nokia 8.1, a mid-range smartphone, in Dubai in a bid to strengthen its market share. The 6.18-inch notched screen has a resolution of 1080 pixels and is powered by a Qualcomm Snapdragon 710 chip set with Artificial Intelligence capabilities. The device features dual rear cameras — one with a 12 mega pixel (MP) Zeiss sensor and the other with a 13MP sensor for depth sensing. The front camera features a 20MP sensor. Running the Android 9 Pie operating system (OS), it comes with a 3,500mAh battery and is priced at Dh1,499. The device will be available in the UAE from December 15. According to Counterpoint’s latest research, Nokia was the fastest-growing smartphone vendor, with a year-on-year growth of 73 per cent in the third quarter of this year. According to industry reports, HMD sold 59.2 million feature phones and 8.45 million smartphones last year. This year, HMD shipped out four million smartphones in the first quarter, followed by 4.5 million in the second quarter and 4.8 million in the third quarter, according to Counterpoint. Nokia, however, accounted for just 1 per cent of the global smartphone market share in the third quarter. 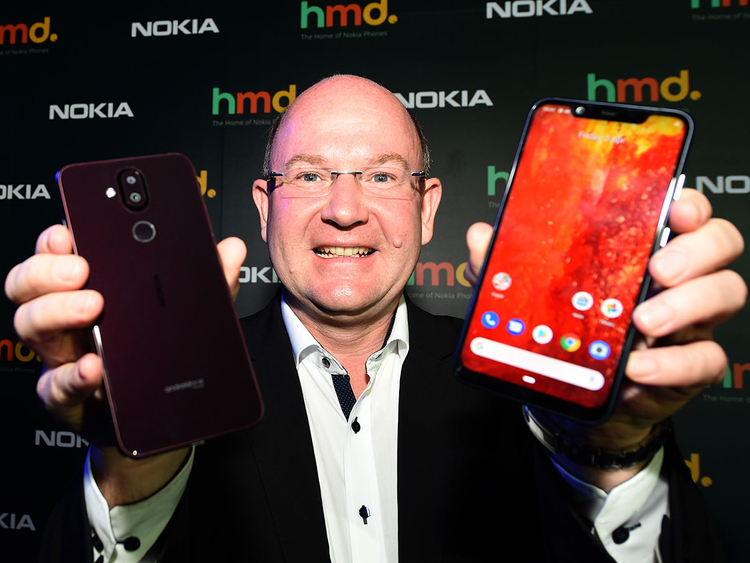 Florian Seiche, CEO of HMD Global, said when feature phones and smartphones were lumped together, Nokia was number one in the Middle East and Africa, and number one in 30 countries. Seiche said that Nokia was last year number one when it came to feature phones in terms of value. This year, it was number one in terms of both value and volume. Last year, iTel took top spot in terms of volume.